59 S T A R T H E R E 2 0 1 8 Your First Printer and Initial Output Expectations Maxwell believes it's important to find out what your target applications are, before discussing an entry point. "Different technologies serve an array of applications—what suits one may not suit another; getting a good handle on target applications, production volumes and a growth forecast is necessary," he says. "Will the primary applications be indoor or outdoor? Signs and banners? Soft signage? Rigid graphics or printing on objects? What's the minimum width required? What are the projected volumes in 3, 6, 12 months and beyond?" Conrad notes its best to buy for next year. 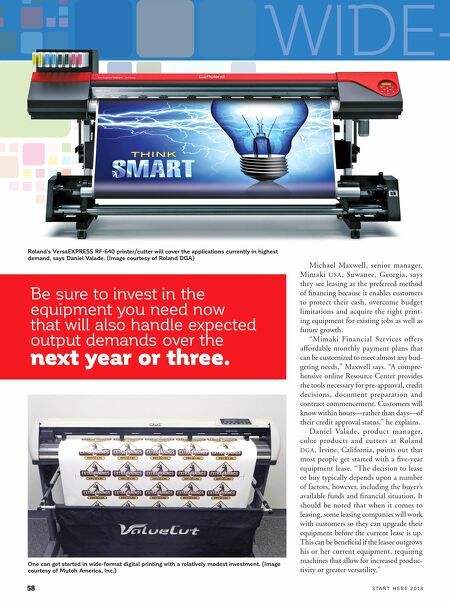 "If you are setting up a sign shop to print banners and displays, but know you'll be growing into vehicle wraps a year from now, don't skimp on the 54-inch printer when you really need a 64-inch Large-format printing equipment is available in a wide range of sizes and shapes, says Mimaki's Michael Maxwell. Pictured is the Mimaki LFX200-2531 extended bed flatbed printer. (Image cour- tesy of Mimaki USA) wide printer. Stepping over nickels to pick up pennies is not a good habit to get into. 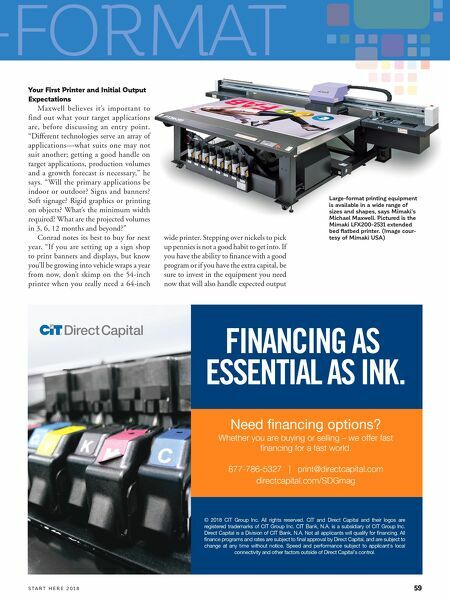 If you have the ability to finance with a good program or if you have the extra capital, be sure to invest in the equipment you need now that will also handle expected output WIDE-FORMAT Need nancing options? Whether you are buying or selling – we offer fast financing for a fast world. 877-786-5327 | print@directcapital.com directcapital.com/SDGmag FINANCING AS ESSENTIAL AS INK. © 2018 CIT Group Inc. All rights reserved. CIT and Direct Capital and their logos are registered trademarks of CIT Group Inc. CIT Bank, N.A. is a subsidiary of CIT Group Inc. Direct Capital is a Division of CIT Bank, N.A. Not all applicants will qualify for nancing. All nance programs and rates are subject to nal approval by Direct Capital, and are subject to change at any time without notice. Speed and performance subject to applicant's local connectivity and other factors outside of Direct Capital's control.